On February 8, 1977, U.S. Patent #4,006,714 was granted for the Goossen Moo-ver Dairy Crowd Gate. The Moo-ver Dairy Crowd Gate has always offered the best cow traffic. The Moo-ver Dairy Crowd Gate not only makes the holding pen smaller, it talks to the cows with the bell or horn which informs them that the gate, which they respect, is moving forward. During the past 30 years, minor changes have been made to the Moo-ver Dairy Crowd Gate. We have recently implemented many major changes and improvements. The carriage unit equipment has been removed from within the metal box and is being installed on a 1/2" PVC base for easier access to install and service. 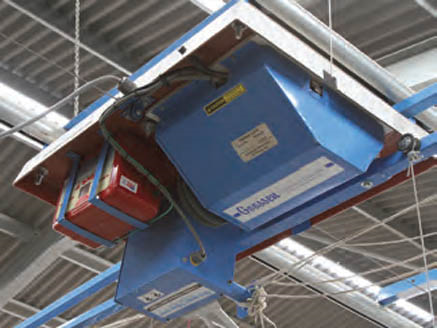 A metal cover is placed over the equipment. 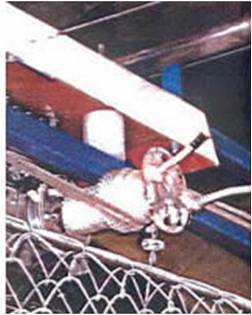 The control unit has been changed to a moisture-proof unit made from PVC plastic in place of the metal box, also with simpler controls. 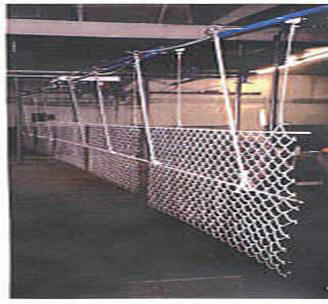 Chain link gate panels are a great improvement over the weighted drop cords or the suspended aluminum angle bars. Rear view of a Goossen Moo-ver Dairy Crowd Gate designed for a 36' wide holding pen. Gates can be purchased for almost any width. The Moo-ver Dairy Crowd Gate in the raised position to return over the next herd entering. The new chain link panels work especially well with the gate lift when returning to the outer end of the holding over the next herd entering. This is the panel in the lowered position. Better Cow Traffic with a Moo-ver Dairy Crowd Gate Means More Productive Milk Time!